Unfortunately for birds, they didn’t come with powerplants that they developed whilst evolving into who they are today. So we won’t have to worry about coming up with a way to power “flapping” for quite some time, but we still have a lot to learn from our predecessors. Why does this matter? And why am I avoiding much more pressing morning tasks by writing about this? Because the future is going to be pretty cool, despite being a little short on oil and other resources we’ve been spoiled with. But that is precisely what is driving a lot of the innovation today – we don’t have a choice. We simply have to go through the air smarter if we want to keep doing it. Here are some really simple and interesting observations that we’ve known all along, but never employed. If you monitor industry specific media (such as Aviation Week and Space) you’ll notice that some key parts are starting to change. Where wings (and other control surfaces) meet the body / fuselage: The bird’s wing has a gradual morphing from body to wing – the transition is smooth. The ultimate winner here is the penguin, but penguins have one thing that airplanes don’t – buoyancy. Nevertheless…. compare the penguins fuselage with pretty much everything flying today – the tube that meets the wing. There is some laziness (and practical benefits) of slapping sewer pipe onto a wing. 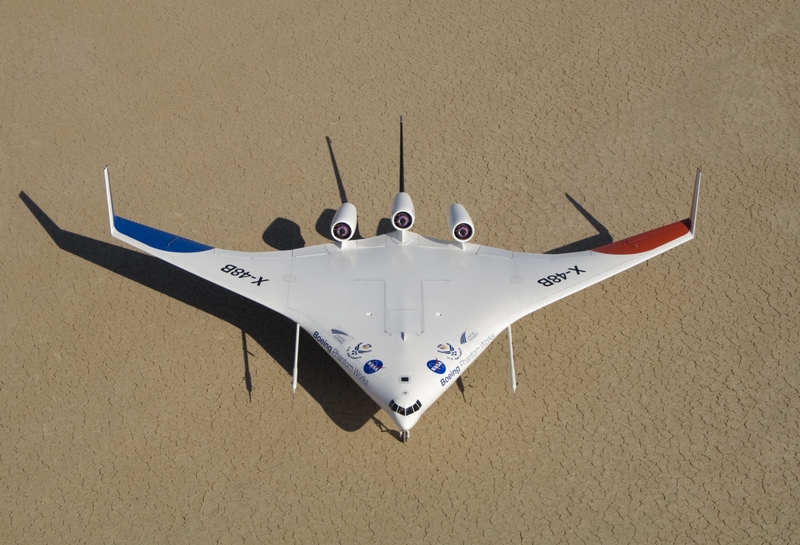 But the most untrained and airplane deficient among us could clearly point to the superiority of the bird design, despite the familiar look of the conventional airplane shape. Strength: Sure we know about composites, fancy metal, etc. But consider the elegant biomimicry fact that bones are very strong and lightweight. Ever wondered how a hundreds million years of “bone refinement” might actually be the best design? The interspatial connections, within the bone, allow for many small stress tie in points that yeild great strength overall. Aircraft get some strength from the stretched metal over the skeleton, but the penalty they pay for in weight is for the big spar, big tie in points. (You know, the big thing that prevents the wing from folding up.) 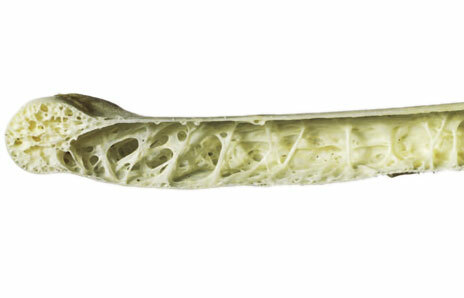 This bird bone picture gives you a great perspective on how it ought to be done. Lifting body: This is old news to folks who remember the opening credits of Steve Austin: The 6 Million Dollar Man. He flew a flying body – albeit crashed it in order to gain his bionic rebuild status, but the concept of lifting bodies has been around for some time. Why care? Well, we should have been stuffing people and cargo into wings a long time ago. The problem with the wing is that you have a mission specific appendage that doesn’t do much except carry engines and fuel. Smooth Moves: Another great feature of resource scarcity is that is forces aircraft people to look at everything. Again this has brought us back into the bird realm in how control surfaces move. An article by Graham Warwick in this week’s AWST shows us just how far some designs have gone to squeeze a few drops out of every part of the flight. The fact is that all the commotion you see out there on the wing (take off flaps, landing flaps, slats, spoilers, etc.) is not the most glamorous way to negotiate with the air. The VCCTEF (variable-camber continuous trailing edge flap) system is basically what birds do – twist it and curve as need be to optimize for best camber at all times. Ok, glad I got that all of my chest. Enjoyed this morning’s musings? Ask Adam to demystify something else about aerospace. Previous Previous post: Simulation for Management?